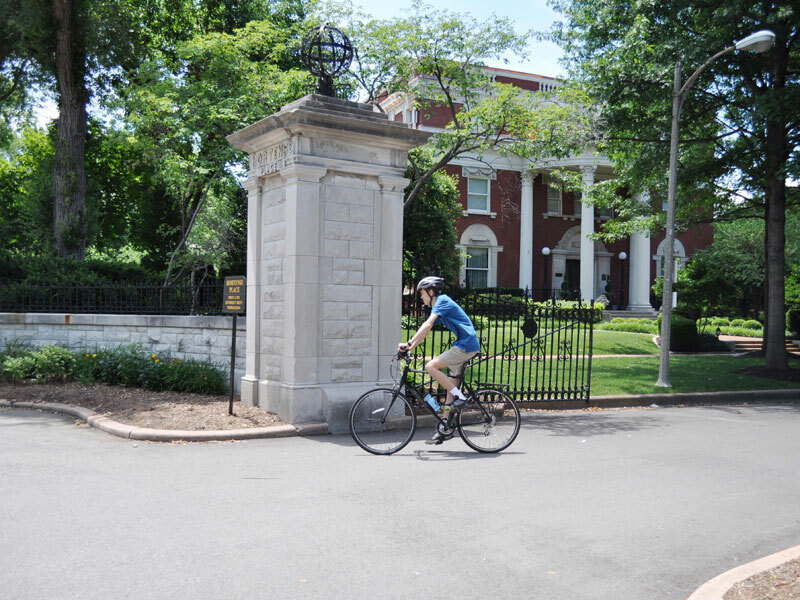 Located west of downtown St. Louis, the Central West End or "The CWE," as locals often call it, comprises 112 city blocks nestled between St. Louis's crown jewel Forest Park (a 2013 APA Great Public Space) and the St. Louis University campus. Bounded by Delmar Boulevard to the north, Vandeventer Avenue to the east, Interstate 64 to the south, and Kingshighway and Union Boulevard to the west. Cycling through the private places. Photo by Connie Tomasula. 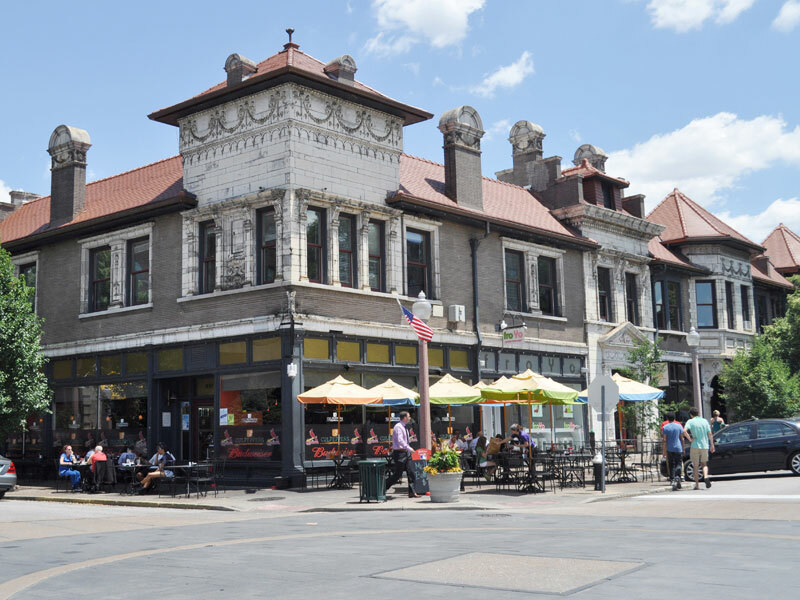 The CWE is a neighborhood designed for the pedestrian with its array of sidewalk cafes, boutiques, historic streetscapes, and even the World Chess Hall of Fame. Locals and tourists alike flock to the neighborhood's mixed-use district along Euclid Avenue. Iconic griffin-adorned lamp posts, tree-lined sidewalks, and a dense clustering of statues and other public art add to the CWE's pedestrian-scaled amenities and attractions. The Central West End is home to 14,000 residents, with twice that number employed at the neighborhood's medical campus. The Washington University School of Medicine and BJC Healthcare campus, combined with the St. Louis College of Pharmacy and the Cortex Innovation District, form one of the largest regional centers of employment and are national leaders in medical research and tech startups. The historic neighborhood's housing stock primarily dates back to the early 20th century, built largely in response to the 1904 World's Fair in nearby Forest Park. World's Fair-era hotels, now restored and converted to high-rise apartments, overlook large single-family, architect-designed homes in ornate Classical Revival styles. Adding to the architectural mix will be no less than three new high rises, representing the largest residential building boom witnessed in the city in decades. Engaged community leadership is pursuing alternative transportation options for the neighborhood, including a Bus Rapid Transit line, a streetcar line, and a new MetroLink light rail stop within Cortex (a recent recipient of a federal transportation grant) to further the Central West End's status as a car-optional neighborhood. Active neighborhood groups work to preserve the local flavor and host annual events to showcase the Central West End including the sometimes risqué Central West End Halloween party (in its 31st year) and the always aromatic St. Nicholas Greek Festival (in its 97th year), drawing tens of thousands of visitors for cleverly costumed people-watching and mouth-watering baklava. A Holiday Window Walk highlights CWE storefronts adorned with festive decorations and holiday lights, while Taste of Central West End highlights the diverse culinary offerings of the neighborhood, among many other annual neighborhood events. 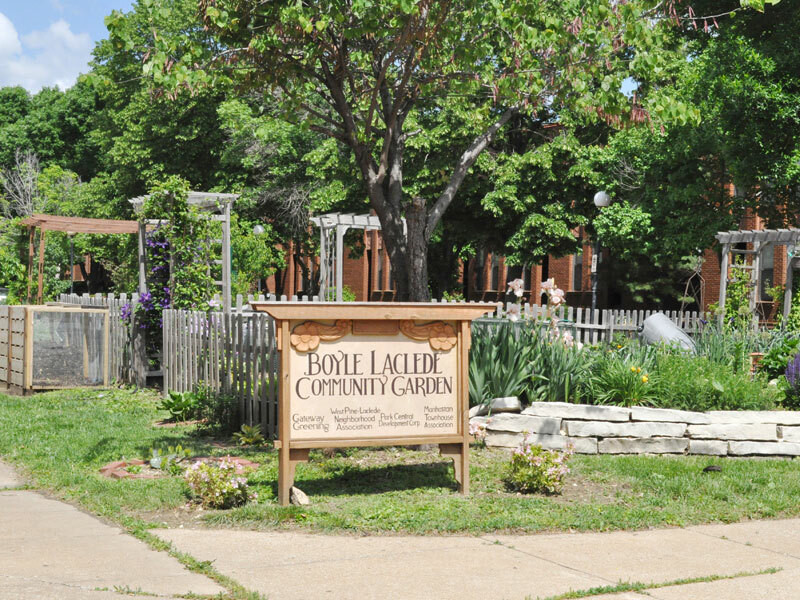 Boyle Laclede Community Garden. Photo by Connie Tomasula. People watching paradise at Maryland and Euclid Avenues. Photo by Connie Tomasula.